Since the confessor is the guide for our souls to God and away from our sins, when a soul doesn’t have that guide, the soul can easily become damaged as it can quickly get lost and wander around in the darkness without proper guidance. When a confessor does a poor job directing souls toward God and away from their sins, then souls may very well be led astray. When the guide of our souls simply isn’t equipped with the knowledge to guide souls correctly, then those souls can mistakenly chose a path of darkness or remain in a perpetual state of mortal sin. 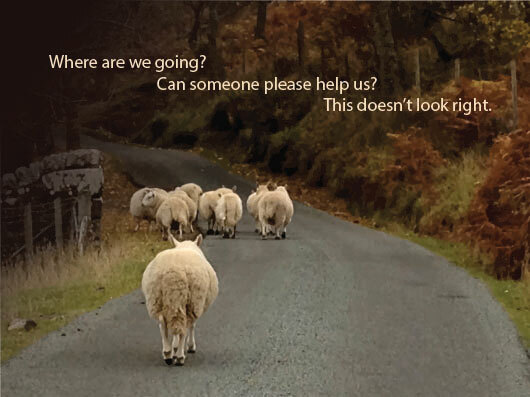 In short, when the confessor offers no beneficial guidance during confession, he leaves the sheep to wander aimlessly without the love, support and council they need to help them find ways to make resolutions to eliminate sin from their lives, as well as to discover—and stay on—the path of holiness. God’s light shines forth through the confessor—in the power He bestows upon them through the Holy Spirit—to give hope to wretched sinners (after baptism) for their salvation. Many people find it very difficult—if not impossible—to avoid sin on their own, and their only chance for salvation in this world filled with darkness is from God, speaking through the mouth of the anointed confessor, in the holy sacrament of reconciliation. When people enter the confessional and believe all they need to do is say they’re sorry and their sins are forgiven, that can leave many confused as to what true sorrow actually is. Countless people think sorrow is proven by their words alone; yet, like faith, actual sorrow is proven through actions and desires. A monumental disservice is being done to penitents when nobody explains to them they need to be actually sorry (hate all of their sins and desire to sin no more (CCC #4151) to be forgiven. Many leave the confessional believing they have been forgiven and are all right with God when they never had any “real sorrow” in the first place and were not forgiven by God. If they only knew, surely they would work harder to amend their ways. How can anyone expect to have eternal life if they still love their sins. We simply can’t love both God and our sins. We MUST love God with all of our heart, soul, mind and strength and our neighbor as our selves. The love of sin–refusal to attempt to stop sinning–is idolatry, and it is mortal. We must educate the people about what really being sorry for one’s sins means. According to St. Theresa, everyone who is willing to die rather than cause another offense against God can say that he truly hates his sins and is ready to die [finally possess contrition in order to be saved]. St. Theresa also says to even consider one’s self a Christian, one needs to daily examine their conscience [so they know the sins they are committing, which offends their Creator, in order to hopefully amend them]. We can’t say we don’t want to sin and perform little to no effort to know our offenses against God. If we do, we are simply lying to ourselves. And that lie could lead to our eternal doom. The understanding of why someone is forgiven has been lost. People have simply been blinded into thinking they can “say” they’re sorry when God who reads the desires of ones heart knows they simply aren’t. Specifically being told to work as hard as one can to stop committing those very sins they’ve just confessed, as they are hurting both God and their own souls, is vital in the sacrament of reconciliation. If the penitent doesn’t understand true sorrow is when they make and perform real resolutions to sin no more, then those words of sorrow they utter may not accurately mirror the desires of their hearts. Salvation could be lost for many who don’t truly desire to change and actually think they can “con God” into giving them eternal life just by saying “I’m sorry,” when the faith and repentance needed simply isn’t there.